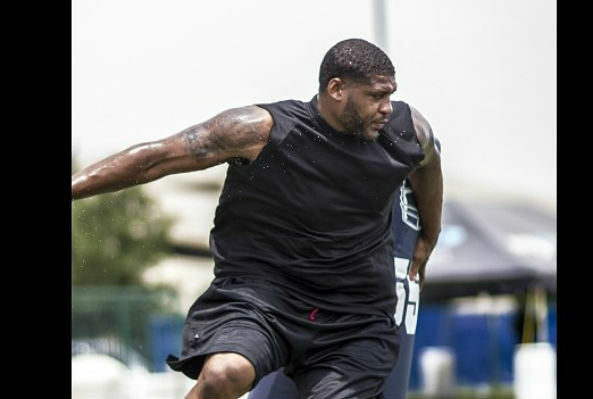 David Carter, a 300-pound NFL defensive lineman with the Chicago Bears, is leaner and faster now than when he ate animals and their byproducts. GQ Magazine is running a feature on what pro athletes in different sports eat on a daily basis to perform at their peak physical performance. They recently featured David Carter, a former Oakland Raiders-turned-Chicago-Bears player, one of the few vegans playing in the NFL. Back in 2014, Carter weighed in at 285 lbs. and was working his way up to a robust 300 lbs by downing milkshakes and gallons of milk. But he was also suffering from painful bouts of tendonitis. After watching a documentary on veganism, he learned that dairy contributes to some forms of tendonitis. In the first month after going vegan, Carter lost 40 pounds, which isn’t a great thing when you’re supposed to be this hulking defensive linemen. But since then Carter’s been able to reach his goal of 300 pounds, and is leaner and faster now than when he ate animals and their byproducts. There requires a lot of extra effort to consume the necessary 10,000 calories that is necessary to maintain that weight, especially on a vegan diet. This means that Carter eats every two hours, and uses cannellini beans and sunflower seeds to give his smoothies protein and thickness. He starts his mornings with his bean shakes and grazes on homemade, probiotic sauerkraut throughout the day. “I try to eat 1.2 grams of protein per pound per day,” he says, “otherwise it’s really hard to gain weight.” His protein comes from a variety of vegan sources: rice and beans; whole grains like millet, quinoa, and couscous; supplements like spirulina and hemp protein; and nuts. Way to go, Carter! Here’s hoping you take your vegan diet all the way to the Superbowl!